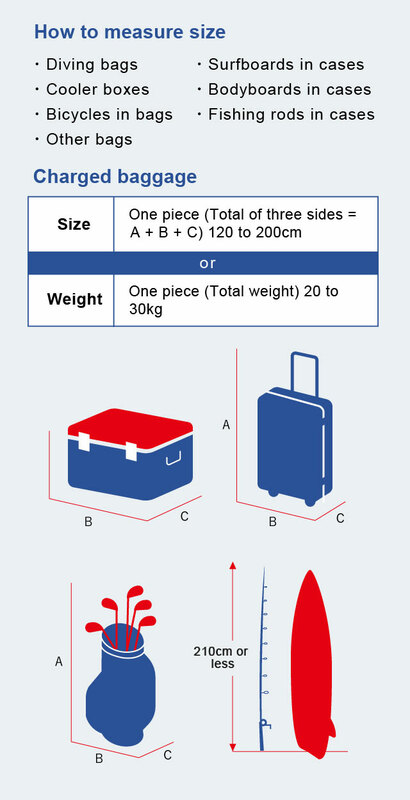 Charged baggage cannot be brought aboard the passenger ship without a baggage ticket. Before boarding, please ask for and purchase a baggage ticket at the ticket window. If there is no baggage ticket attached to the charged baggage, you may be asked to pay a fee at the time of arrival. Always use a case for holding surfboards, bodyboards, fishing rods, etc. To enable the jet ferry to skim across the top of the water, it has a structurally light, compact design. Please note that large or heavy baggage that exceeds the standards cannot be carried on board. Since baggage space is limited on the jet ferries, please use a delivery service company to ship large pieces of baggage. Seeing-eye dogs, hearing-assistance dogs, and service dogs, as well as wheelchairs, etc., may be brought aboard free of charge. Two pieces of baggage per person are allowed aboard the ferry. These restrictions do not apply to handbags, umbrellas, and other personal effects. Three sides adding up to 120cm or less, total weight 20kg or less (if two pieces, the total for both). Three sides adding up to more than 120cm, total weight over 20kg (if two pieces, the total for both；with upper limit of 30kg). Three sides adding up to more than 200cm, total weight over 30kg. Carge includes the consumption tax.